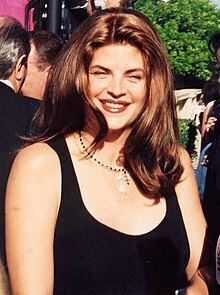 کریستی آلی (اینگیلیسجه: Kirstie Alley) آمریکالی کومدین، یازیچی و اوْیونچو کریستی آلی کانزاس ایالتی بیلیم‌یوردو دا درس اوْخویوب. ۱۹۷۹–گۆنوموز ایللر آراسیندا سینما ساحه‌سینده چالیشیب. 1978 Quark Handmaiden (uncredited) Episode: "The Old and the Beautiful"
1983 The Love Boat Marion Stevens Episode: "The World's Greatest Kisser/Don't Take My Wife, Please/The Reluctant Father"
1991 Flesh 'n' Blood Starr Baxter Episode: "Arlo and Starr"
1993 Wings Rebecca Howe Episode: "I Love Brian"
1997 Ink Dahlia Episode: "Breaking the Rules"
Dharma & Greg Dr. Tish (uncredited) Episode: "The End of the Innocence: Part 1"
2004 Without a Trace Noreen Raab Episode: "Risen"
2006 The King of Queens Kirstie Alley Episode: "Apartment Complex"
2008 The Hills Herself Episode: "Girls Night Out"
2015 The Middle Pam Staggs Episode: "Pam Freakin' Staggs"
2016 Flaked Jackie Episode: "Palms"
7 Team Cha-Cha-Cha / "We R Who We R"
8 Argentine Tango / "Cite Tango"
Semi-finals Viennese Waltz / "One and Only"
Paso Doble / "White Room"
1Score by guest judge Donnie Burns. 5 Night 1 Quickstep / "Mrs. Robinson"
7 Fusion Quickstep & Samba / "Sir Duke"
8 Viennese Waltz / "Hallelujah"
اینگیلیسجه ویکی‌پدیاسی‌نین ایشلدنلری طرفیندن یارانمیش«Kirstie Alley»، مقاله‌سیندن گؤتورولوبدور. ( ۲۱ دسامبر ۲۰۱۷ تاریخینده یوْخلانیلیبدیر). قارداش پروژه‌لرده کریستی آلی گؤره داها آرتیق بیلگی‌لر تاپابیلرسینیز. بۇ صفحه‌‌ سوْن دفعه ‏۱۳ مارس ۲۰۱۹، ‏۱۲:۴۷ تاریخینده دَییشدیریلمیشدیر.